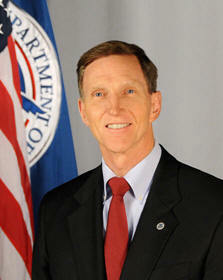 November 4, 2010 – Transportation Security Administration (TSA) Administrator John S. Pistole on Wednesday visited Yemen to meet with government officials including Deputy Prime Minister Rashad al-Alimi, officials from the Directorate General of Civil Aviation and the Ministry of Interior as well as the U.S. Ambassador. The TSA Administrator also received briefings from TSA inspectors deployed to Yemen and expressed his gratitude for their work. Additionally, Pistole toured a cargo facility in Sana’a. Tuesday, Pistole spoke to the International Air Transport Association’s (IATA) AVSEC World Conference in Frankfurt, Germany, met with international aviation security officials and signed an international security agreement with Germany. Following the disruption of an attempt last week to ship explosive devices on board aircraft bound for the U.S, TSA and the Customs and Border Protection (CBP) took immediate measures to enhance existing protocols for screening inbound cargo, including grounding packages originating from Yemen destined for the U.S. and deploying a team of inspectors to assist the government of Yemen with their cargo screening procedures. While in Germany yesterday, Administrator Pistole joined officials from Germany’s Federal Ministry of the Interior (MOI) and Ministry of Transport (MOT) in signing a joint declaration that provides the framework for additional collaboration on aviation security. The U.S. and Germany have worked together to enhance the sharing of aviation security best practices. This cooperative partnership will help facilitate mutual aviation security goals to harmonize measures that continue to ensure the safety of travelers. The Department of Homeland Security (DHS), including TSA, has successfully engaged with other governments and international security partners to share information on security practices. DHS and TSA have entered into a number of bi-lateral and multi-lateral agreements with foreign security partners and have worked with the aviation industry to continue leveraging knowledge of foreign cargo screening practices to strengthen air cargo security and fulfill the 9/11 Act mandate. Pursuant to the 9/11 Act, TSA has taken significant steps to increase the security of air cargo on passenger aircraft. Under this Administration, TSA requires all cargo that is transported upon domestic or international outbound passenger aircraft to undergo security screening. In addition, all cargo flying to the U.S. on passenger or all-cargo planes, must meet TSA security standards which include specific requirements covering how facilities and cargo are accessed, the vetting of personnel with access to cargo, employee training, and how cargo must be screened. Further, all international inbound aircraft carrying cargo must provide cargo manifest information to CBP prior to arrival on long-haul flights and at wheels-up on flights from Canada, Mexico, and the Caribbean, for additional screening upon arrival in the U.S. DHS routinely provides threat briefings to air carriers and the private sector, and TSA conducted a tabletop exercise with carriers in August that included a scenario focused on IEDs on board commercial and cargo planes. In October, the U.S. joined 190 countries to officially adopt the International Civil Aviation Organization’s Declaration on Aviation Security forging a historic new foundation for aviation security that will better protect the entire global aviation system from evolving terrorist threats. Through the Declaration, the Assembly recognizes the need to strengthen aviation security worldwide and urges Member States to take steps to enhance international cooperation to counter threats to civil aviation, including developing and implementing strengthened and harmonized measures and best practices for air cargo security.